A character merit assessment reviews the front and street-facing sides of a house to determine if it retains character features. Apply for assessment before renovating, redeveloping, or demolishing a house built before 1940. Character merit assessments are part of our Heritage Action Plan. Character merit assessments are not applied to outright zones (RS-1) at this time but may be in the future through the Character Home Zoning Review. Read the administrative bulletin (180 KB) to get direction on the general scope and documentation needed for projects proposing the retention and renovation of character merit buildings. Character buildings can be defined by a number of criteria. Some zones – RT-3, RT-7/8, RT-10, RM-1, and RT-11 – use the construction date as the first measure of character merit. In most zones, any building constructed before 1940 is considered a character building if it has surviving authentic or period features. Overall shape, form, and size of the house. Shape of the original roof and dormers (windows that project from a sloping roof). Original open front porch or veranda, or only partially filled in, or other original entry feature. Original cladding or replacement exterior wall material consistent with pre-1940 house. Original location, size, and shape. The windows themselves do not necessarily need to be original. 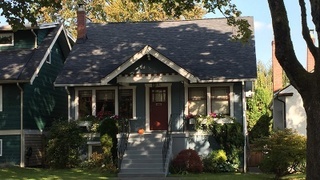 Examples include fascia, window casing or trim, eave brackets, soffits, exposed beam or joist ends, half-timbering, decorative shingling, porch columns, original wood doors, entry transom or sidelights, decorative or feature windows (special shapes, bay windows, crafted or leaded glass), stone chimneys, piers or foundations, secondary porch, turrets, etc. House is part of a streetscape with 2 or more character houses.